The Zuzu Store: Collectable Memorabilia of all things IAWL! I have written a cookbook with the help of my friends Kathy Deane and Rich Goodson. There are two reasons why I decided to write another cookbook. After 45 years my Mother's recipe box surfaced and I went through memory lane preparing all the dishes that I grew up with, and I felt like I wanted to share this memory. Then Rich Goodson offered to share his huge collection of rare photos from It's a Wonderful Life. Kathy Deane is a very dear friend who has compiled the book with her artististic talent and it is just beautiful. It was a match made in heaven. This soft cover book is 6" x 9" with 169 pages. 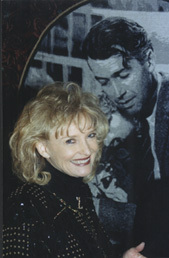 In June of 2006 It's a Wonderful Life was voted the most inspiring movie of all time by the AFI. (The American Film Institute) The story, the characters, the very substance of the film speaks to all of us. This book is a tribute to that honor.